Featuring Kawai’s highly regarded RM3 Grand wooden-key keyboard action, and stunning Progressive Harmonic Imaging sound technology, the new CA13 offers an excellent introduction to Concert Artist quality at an attractive price. 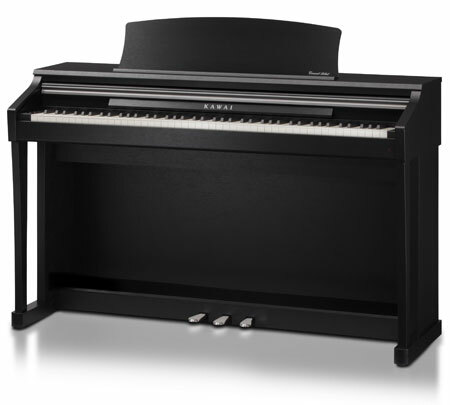 With modest additional features, this attractive instrument is ideally suited to piano playing purists that demand a realistic keyboard touch and highly expressive piano tone. One of the most important characteristics of any piano is its sound. Bright, mellow, dark or warm, a fine piano is detailed and expressive, and inspires the performer to play with their utmost feeling and emotion. The beautiful sound of Kawai’s hand-built EX grand piano is at the heart of the new CA13, with all eighty-eight keys of this world-class instrument painstakingly recorded, analysed, and reproduced as high-fidelity digital waveforms. Recording each key individually in this way preserves the rich harmonic character of the original EX grand piano, and guarantees that the sound heard when playing any one of the CA13’s keys is a faithful representation of the acoustic source. Yet when playing a fine piano, the tonal character of each note changes dramatically depending on the amount of pressure applied to the keyboard. Therefore, in order to capture a realistic acoustic portrait of the EX grand piano, not only is each key recorded individually, but also at various different volume levels, ranging from gentle pianissimo to thunderous fortissimo. The new CA13 offers a highly detailed acoustic portrait, employing exclusive Progressive Harmonic Imaging sound technology to ensure smooth tonal transitions across the keyboard and throughout the entire dynamic range. Embracing many of the long-established principles associated with an acoustic piano, the CA13’s RM3 Grand keyboard action combines realistic materials, motion, and mechanism to recreate the exceptional touch of the finest concert grand pianos. All eighty-eight black and white keys are crafted entirely from long pieces of wood, with finely textured ivory-like surfaces applied to absorb moisture and assist control. Each wooden key pivots smoothly on a central balance pin, replicating the familiar ‘seesaw’ motion of an acoustic piano action. When pressed, the back of each key triggers a grade-weighted hammer to play the note, while additional counter-weights are also placed at the front of the bass keys, helping to lighten their heavier touch during pianissimo passages. With over eighty years of experience in building the world’s finest acoustic pianos clearly influencing our digital piano engineers, the CA13 is guaranteed to deliver a truly remarkable playing experience that will satisfy the demands of even the most discerning pianist.